A teenager wearing a "Make America Great Again" hat stands in front of an elderly Native American singing and playing a drum in Washington on Friday, Jan. 18, 2019, in a moment that's been dissected and debated on social media. Lawyers for Nicholas Sandmann, the Kentucky teen seen in a viral video surrounded by high school students and face to face with a Native American man, are suing the Washington Post for $250 million, saying the paper was reckless and bullied the student. 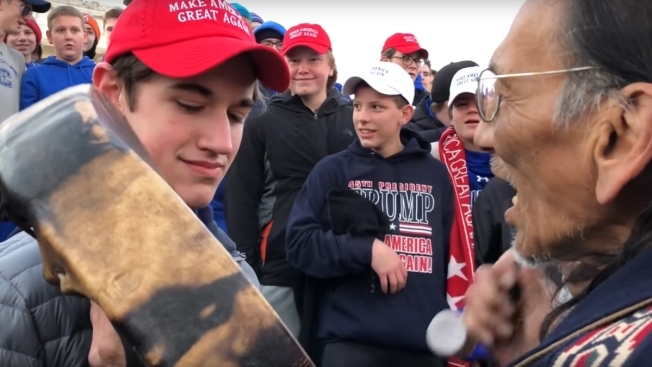 Sandmann, 16, is a junior at Covington Catholic High School, an all-boys school that was at the center of a national debate after students were captured on video apparently encircling Native American elder Nathan Phillips, who was playing a drum and chanting, in front of the Lincoln Memorial during the Indigenous People's March. The video went viral on Twitter before eventually being removed as other videos of the event surfaced, showing a more complicated story. The Kentucky-based firm Hemmer DeFrank Wessels filed for $50 million in compensatory damages and $200 million in punitive damages from the Washington Post, plus legal fees. They say the total is the same amount that Amazon founder Jeff Bezos paid to buy the paper. 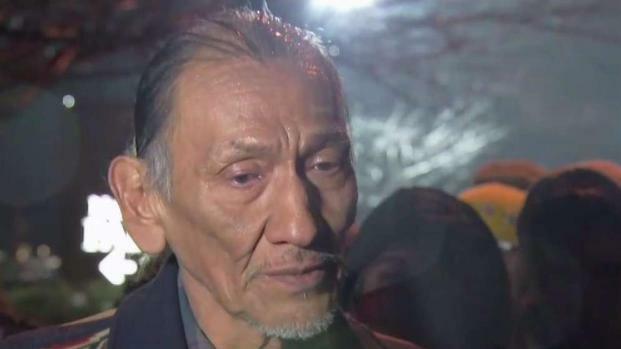 Nathan Phillips, a 64-year-old Native American and U.S. Marine Corps veteran, says he was saddened and frightened when a crowd of high school students harassed him Friday. News4's Darcy Spencer reports. Other video footage has revealed a more complex portrait of the incident than what was initially described in this video. CORRECTION (Jan. 24, 7:35 a.m. ET): This video has mischaracterized Nathan Phillips’ military service. Military records show that he served in the U.S. Marine Corps but did not serve in Vietnam. The lawsuit alleges the Post "wrongfully targeted and bullied Nicholas because he was the white, Catholic student wearing a red 'Make America Great Again' souvenir cap on a school field trip to the January 18 March for Life in Washington, D.C."
Kristine Coratti Kelly, vice president of communications at the Post, said they are reviewing a copy of the lawsuit. "We plan to mount a vigorous defense," Kelly said. A number of videos posted online showed a complicated and tense situation near the memorial on Jan. 18, when a group of Black Hebrew Israelites, Native American activists and Covington Catholic students all crossed paths. Thousands of people who viewed the video on Facebook and Twitter cast blame on either Sandmann and his classmates, who appeared to be disrespecting the Native American during the Indigenous People's March, or Phillips for appearing to antagonize the teenagers. News outlets, including The Washington Post, NBC News and NBC Washington, reported on the viral outrage and video clip of Sandmann wearing a Make America Great Again hat and appearing to smile as he stood close to Phillips as Phillips continued to beat on his drum. Phillips later said he was trying to defuse a confrontation between the students and the Black Hebrew Israelites but soon felt threatened when the students surrounded him. Students from a Kentucky Catholic High School appeared to harass and mock a Native American demonstrator during a rally in Washington D.C. The lawsuit alleges the Post "rushed to lead the mainstream media to assassinate Nicholas' character and bully him." It alleges that the Post stories implied that Sandmann instigated the confrontation, which the student has repeatedly denied. Videos that surfaced later showed a group of people associated with the Black Hebrew Israelites heckling the group of students and Phillips approaching Sandmann. Sandmann later appeared on the TODAY Show to defend himself and, according to the lawsuit, try to stop threats of physical violence toward him and his family. An investigation spurred by his school said the students were not to blame for the encounter.